Your customers want to share their virtual and mixed reality experiences in real-time with their friends, family and co-workers. Your company needs to find new ways to engage their mixed reality and virtual reality user base through collaborative multi-party sessions while minimizing unnecessary development costs. Your developers want to work with an SDK with intuitive software libraries and extensive example code so that they can spend more time developing new AR/VR technologies. LiveSwitch, the massively flexible WebRTC SDK and server stack from Frozen Mountain, allows AR/VR developers to easily add voice, video, and text chat capabilities into their applications. With the ability to securely transfer any data including spatial audio, coordinates, depth, color, mesh data and metadata, augmented and virtual reality innovators can create the collaborative experiences that they want without worries of data transfer limitations. LiveSwitch includes all the power needed for multi-party media streaming and signaling in one complete package, ideal for real-time AR/VR applications. LiveSwitch creates a voice/video connection between two or more parties and enables a seamless transfer of any data, allowing remote participants to connect visually and share across distances. 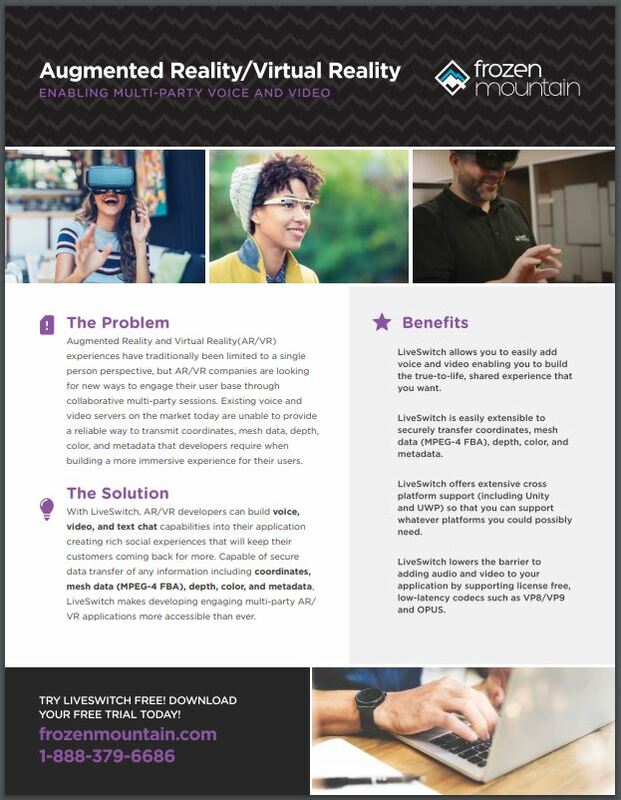 No matter your augmented or virtual reality use case, LiveSwitch has all the flexibility and functionality needed to build a successful multi-party application.